In the mind of the Leftist, no one on the Right can be good or do good works of any kind. And if you are a Trump supporter, then you must be evil. If Republicans have a tarnished brand, then it’s mostly because the Leftist media has painted them so. And when the Left is so focused as to blur out a pro-Trump t-shirt, then you know how determined they are to control the narrative. The media has played defense for the last eight years, ensuring that Barack Obama never looked bad, even when he was returning gifts from other countries or giving inappropriate gifts to heads of state, or during the Solyndra debacle, or the Obamacare fiasco, or his various moments of ginning up racial animus. However, I think the news media had an easy time defending Obama because the public wasn’t as outraged as it could be. I think deep down everyone understood that Obama was incompetent and that poor decisions were going to be part of the package with the first affirmative action President. But now there’s Hillary, and she’s just a dumpster fire. More importantly, however, we have this crazy election cycle where the Left was — for a short time — not this mindless block of voters marching in unison. There were actual, tangible degrees of Leftism within their ranks The Far Left actually gave the Less Far Left a run for their money with the rise of Bernie Sanders. Unfortunately for the Far Left, they’re not the ones in control of the news media, and for the first time in their lives they got to see weapon they enjoyed pointing at others suddenly pointed at them. And I’m not just talking about biased reporting; I’m talking about he collusion of the news media and the DNC as revealed by the Wikileaks dump of the hacked DNC emails. Trump is right: The system is rigged. The news media was supposed to keep everyone — especially the government — honest. Instead, they’re playing at being kingmakers. 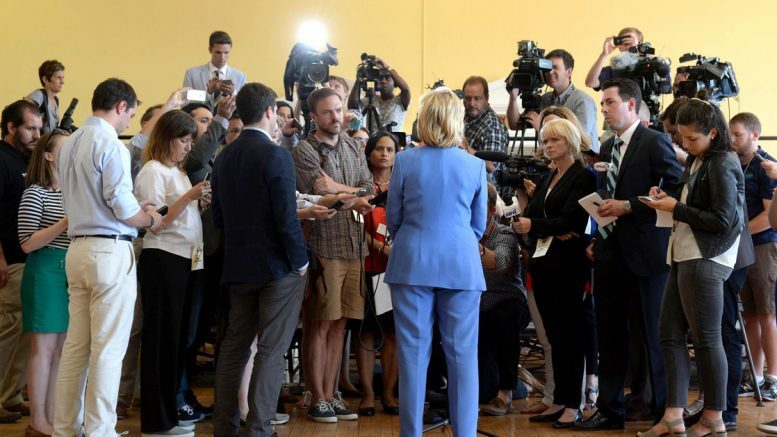 Be the first to comment on "How Far Will Leftist News Media Go to Cover for Hillary Clinton?"